We got into a sleeping position that was reasonably comfy considering we were in the front seats of our Skoda, wrapped in our warm clothes and sleeping bag. As Kel mentioned it was an incredibly still night, with a perfect, clear view of SO many stars. It was probably the starriest night we’ve seen. Not too long after we drifted off to sleep, a snow/windstorm arrived shaking the car from side to side with snow completely covering the windows. Both Kel and I woke up and looked at each other, made a face like ‘oh great’ and then that was it. He didn’t say anything like ‘gees this is scary’ so I thought ok well we must be fine! (we discussed this in the morning and both of us were actually so scared but Kel didn’t want to say anything to scare me haha) l just tried to go back to sleep pretending the wind would lull me back. We both woke up many times throughout the night, absolutely freezing. Kel put the heating back on for a bit every now and then. I remembered we had an emergency space blanket each (thanks mum and dad) and so we decided to try it! All wrapped up, we again tried to sleep. I was quite surprised at how well the blanket worked! It really did trap the heat in, for me at least, not for Kel. The next time I woke was at 6am, with a continuous gale wind force of snow hitting and shaking the car. I could faintly see car lights on where the camper van was and so I thought we better start our car and get a move on. It took a long time to warm the car up! Kel checked on the bikes which were outside the car to make more space for us and they were absolutely covered in snow! I wanted to freshen up a bit so I started brushing my teeth in the car. I quickly opened my door to spit but due to the force of the gale, toothpaste came right back covering me and the car!!! I should’ve known!!! The wind here is so strong. We think Faroe Islands tops it off with the strongest wind, but Iceland comes very close. Even in the car rental agreements, they say to always hold your door when opening it in case the door swings back and gets damaged due to the wind. It was clear we were in a wind/snow storm because the further we drove the clearer it got. Kel and I had parked the car in that particular spot so that we would be close to the entry point of the drive to see a plane wreck on Solheimasandur Beach. There’s no signage off the road telling you where it is, so it’s a bit difficult to find, but Kel found a good website with directions. As we got to the driveway there was a sign saying the wreckage was about a 4 km drive to get to there. Kel was contemplating the drive as it was off road and there was thick snow and we’d never driven that deep in the snow before. Our car was low to the ground and he was worried we’d damage the underside of the car and possibly get bogged. Because we both had wanted to see this place for a long time we decided to go for it. It was such a crazy drive considering it was very snowy and icy and you could not see the plane in view at all! There were these rocks which were meant as a guide to get there but due to the snow they were difficult to see! A higher car would’ve been better but our Skoda handled it! We arrived and boy what a sight!!! It was SO eerie! Apparently it was a US Navy plane that was forced to land on the black sand beach after experiencing severe icing in 1973. All crew members survived which I am happy about because it was haunting enough! We were all alone too. The weather was quite good when we had arrived but after only being there 10 minutes, the wind/snow storm was moving in on us (The same storm that we had escaped from where we were sleeping). The visibility was really getting low and after another 5 minutes we decided to quickly get out while we still could. Kel had read online of people getting stuck out there in the snow and we didn’t want that! Where the plane landed is on private land. The owners of the land left it open for tourists to see because it really is a beautiful scene that one must see when visiting Iceland. However, a couple days after visiting, we read online that the owners had closed the land due to tourists not following the guided rocks and driving anywhere they please, disrupting the land. When we were driving we could see tyre marks going off the designated track that they were talking about! We did our best to follow the guided path. So we felt pretty lucky to get the chance to see it when we could. I believe it has since reopened but only for hiking. 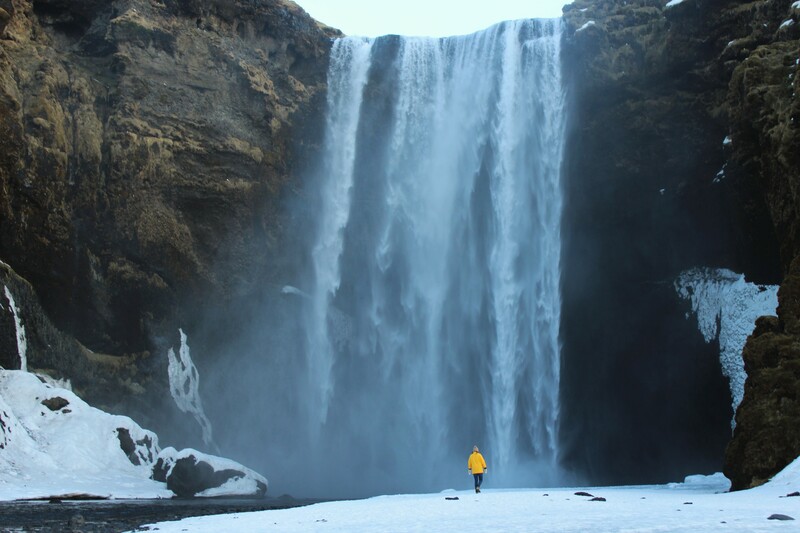 The next stop on our list was Skogafoss! It was such an amazing waterfall to see and thankfully because we had woken up early, we were the first ones there!! You can walk up lots of stairs to the top and just before the top was a view point which was pretty scary! If you’ve seen Justin Bieber’s video clip to ‘I’ll show you’ – you can see him sitting at this point haha. It is such a large and powerful waterfall. While we were standing next to it, we got saturated. This was our favourite waterfall. Seljalandsfoss waterfall was next. As we were approaching we saw that there were many cars and even trucks! We had a guy flag us down saying a movie called ‘Kung Fu Yoga’ was being filmed and that some of the area near the waterfall will be blocked off. It was a bit sad as at this waterfall you can even walk behind the waterfall which is pretty awesome, unfortunately that was blocked off by the film crew. Anyway it was really interesting seeing this film crew with all of their equipment! I even spotted Jackie Chan! It was pretty funny, as I had our camera out, I was looking through the lens zooming in just to have a look and then a man looked straight at me then quickly turned away, put his hat on and raised his collar and even got a crew member to put an umbrella up to block me!!! It was then that I realised it was Jackie Chan! What a bit of a diva haha. This waterfall was nice but unfortunately our experience was tarnished with the film crew blocking off half of it. Seljavallalaug pool was next. This one is also not marked on the ring road and was a bit hard to find but we got there in the end. It’s in a valley below Eyjafjallajokull! Basically you go on a bit of walk to find an old swimming pool built in 1923 where the water comes from a nearby hot spring. Luckily for us, there was only one other girl there who was taking photos. We had planned on swimming here but it actually wasn’t hot at all. We had other places we wanted to see and a lot of ground to cover so we decided to leave. It was a really beautiful location. Near the top of the mountain was some really cool rock formations. The day was going SO fast and our last adventure was a 3.5km (one way) hike through snowy mountains to natural hot springs! I am so happy Kel found this for us to do because this is one of the highlights of our trip for me. It was about 4pm and many people were coming back as the sun was about to start going down. The people who came down the mountain said we’d have to hurry because it’s a long walk there and back, and because the sun was going down soon. We really wanted to swim in natural hot springs before we left Iceland so we left in a hurry! We tried our best to make our way up and down the snowy mountains – thankfully we still had our spikes from the hildibrand crew which we really needed so we didn’t have a problem on the icy parts! It was amazing walking on the edge of these snowy mountains with big clouds of gas emerging from the ground! After about 40 minutes of fast walking we could see a group of people relaxing in the steamy river. We found a spot to ourselves and got changed into our swimmers. It’s free to go there and was even maintained with a boardwalk (partly covered in snow) and a place to hang your clothes. I was first to go in but the water was way too hot!! We had to move down stream where cold water was also joining the hot water so we could get a nice warm spot. It was pure bliss relaxing in the warm water!!! After an hour of relaxing, we quickly got changed back into our warm clothes and walked back to the car. The timing was perfect as when we were walking back we had a beautiful sunset. We drove into Reykjavik, found Kex hostel (thanks for the recommendation Andy! ), spoke to a few people then went to bed! It was a long day! The next morning we left the hostel and dropped our bicycles at a bike shop for them to pack our bikes up for our flight the next day. We also had the challenge of trying to find plastic bags we could use to put our panniers in since you can only check in one bag each. This was quite difficult but Ikea saved us just in time!! We then went back to Reykjavik to walk around the city. There were so many cute shops and funky cafes and restaurants. At about 6pm, we started making our way to the airport where we would be spending the night as our flight was at 7am the next morning and we didn’t want to spend $100+ on a hotel for 12 hours. Before the airport were signs for the Blue Lagoon, so we went to go have a look. The water in the blue lagoon is actually from the geothermal plant next door which you can see on the way in. Before I knew much about the blue lagoon I thought it was a natural hot spring but it is actually man made!! The water does have benefits as it is rich in silica but you can really tell the blue lagoon is a massive corporation!! There were so many people in line so I can only imagine how busy it is during peak tourist times but with a 50 euro fee and experiencing natural hot springs for free the day before we decided to give it a pass. We did walk around outside of the lagoon though and the colour of the water contrasted against the black rocks did look spectacular but when you know it’s all man made, it loses its charm. At least it did for me! It seems quite popular for people to go before their flight which seems like a great way to relax before a long flight! If you go, we’d suggest going to the free natural hot springs. We found a spot in the airport car park to organise our luggage before dropping the car back at the car rental place. We had 11 hours to kill until our flight the next morning. A few others had a similar idea as quite a few flights to Europe were leaving around 7am too. Unfortunately the chairs in the airport all had hand rests so it was impossible to lie down and get comfortable. It was a longggg night. In the morning we checked in our bags and bikes (only had to pay US$70 for both bikes!!) and boarded the plane. As we were taking off, we reflected on our amazing time in Iceland. The people and the landscapes have made this country a highlight of our trip. As much as we loved exploring the south, it made us really appreciate the amazing landscapes of the East which are unlike the South. I have no doubt tourism will take off in that part of Iceland over the next few years!! If anyone reading this does go to Iceland and visits the east, be sure to stay with our family at the Hildibrand Hotel! Back to the UK we go! Another great blog! Thank you, really informative and as always fantastic photos! Thank you for the tips about the Blue Lagoon too! Hope you had some more enjoyable food in this part of your trip! You will really love Iceland, I’m sure. We both cannot wait to get back there! Definitely do the hike to the natural hot springs. One of my highlights for sure!